For literacy we had to make a poem with a hidden meaning, can you work out mine? Hi how are you? Cool poem I like it how you put good detail on it. I made a poem before but I think your one is better. How did you make that poem. I really like the poem you should make more. How did you think of that poem? Sup Austin You're poem was great! Lots of good little hints in there that don’t give too much away. I think I was able to guess it pretty easily because that I read a lot. One other thing you might wanna change your background because it was a big give away too what your mystery thing was. Are you proud of your work? Hello No.2 balls,balls and balls Your poem was really good I enjoyed it a lot. 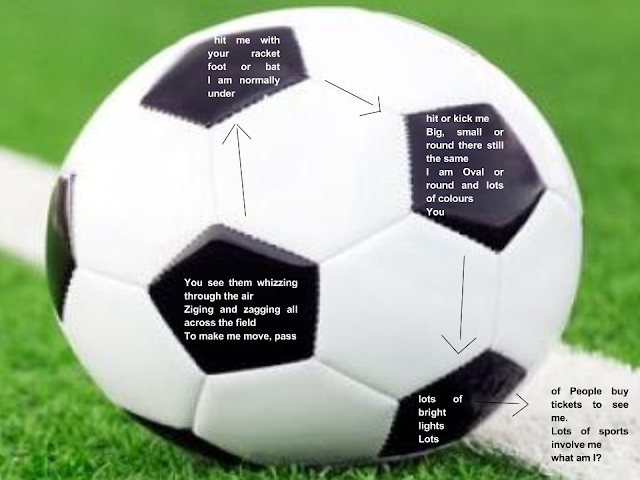 I like too play a lot of sports so it was easy too make a connection in your poem about a sports ball. And it’s pretty easy too see what your mystery thing is when it’s your background. Do you play sports yourself?